The release of EPM 11.1.2 brought many changes across the product set and with the supporting architecture, gone was the ability to deploy web applications using Tomcat and only one option of WebLogic remained. This brought with it a much bigger footprint in terms of memory and pushed many down alternative paths to be able to run the system. There are many reasons why high memory requirements can be restrictive, for instance if you wanted to run the full system for development, training, demos etc and intended on hosting on a laptop, yes it is possible if you pay for very high end spec machine or look to the cloud for inspiration but surely there were other possibilities. With the release of 11.1.2.1 an additional option called compact deployment has become available which allows WebLogic based web applications to be deployed to a single managed server instead of a separate server for each product, so in theory reducing the overall memory requirement. Today I am going to go through the process of deploying using the compact server method, now there are a few things to be aware of first. It is aimed at 64bit operating systems. Is available for new/upgraded 11.1.2.1 installations. Financial Management and Financial Close management are not included; these will still need to be deployed using the standard deployment method, though saying that it is still possible to use a large percentage of FM functionality without the WebLogic piece running. 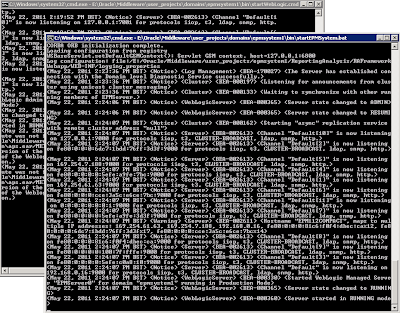 If the managed server crashes for any reason then all the web application running within it will be taken down. This deployment method should not be considered for anything more than a development environment, it wouldn’t be supported either. There are two methods of deploying in compact mode, one when products are configured using a single database and the other when configured using multiple databases, today I am going to cover the single database method as it makes perfect sense to only use one database in this sort of deployment. 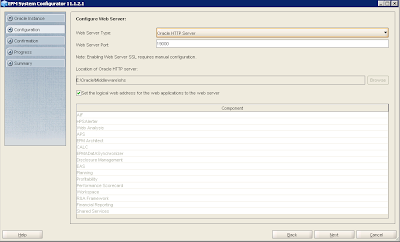 Usually the configurator is started using configtool.bat but using configtool-manual.bat starts the configurator as if the web applications are to be deployed manually, this means there will be no options available for web application deployment. 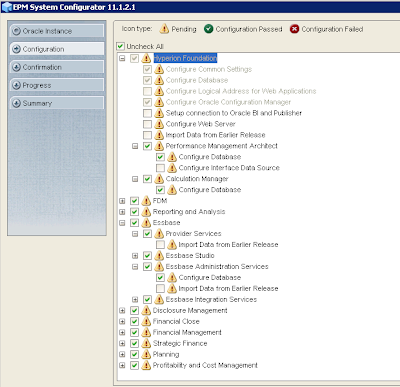 As this a fresh install a new EPM Oracle instance has to be created, I stuck with the defaults which creates an instance with the name of epmsystem1, the instance name is required later in the process. The first-time configuration option is selected and details of the database are entered, this will only have to be entered once as all products are going to be deployed using one database. All the required options will already be selected notice that there are no options available to deploy to application server. 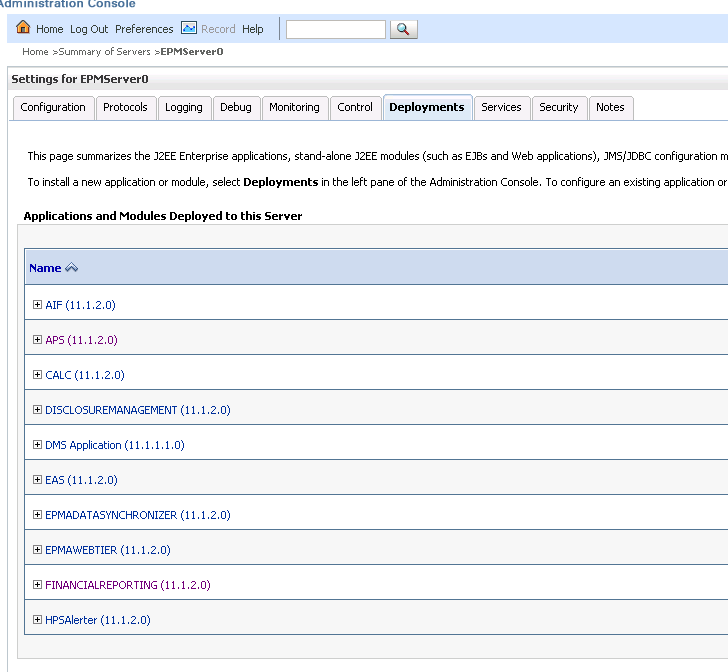 It is also worth noting that the essbase server configuration option is not available either, now you can leave configuring essbase until later or do what I did and configure all the above first and then run configtool.cmd, deselect all and only select Essbase > “Configure Essbase Server”. 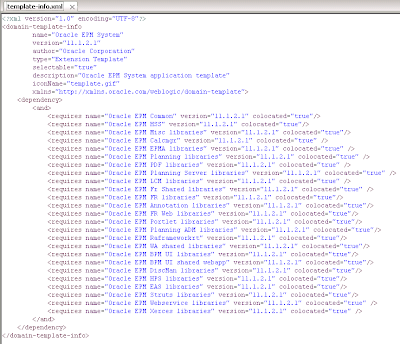 Once all the products have been configured then it is time to move on to the web applications compact deployment. Weblogic Domain user name/password – I stuck with the default username used when configuring EPM which is epm_admin and the password is your choice, you will need these account details if you intend on logging into the WebLogic admin console for the domain. 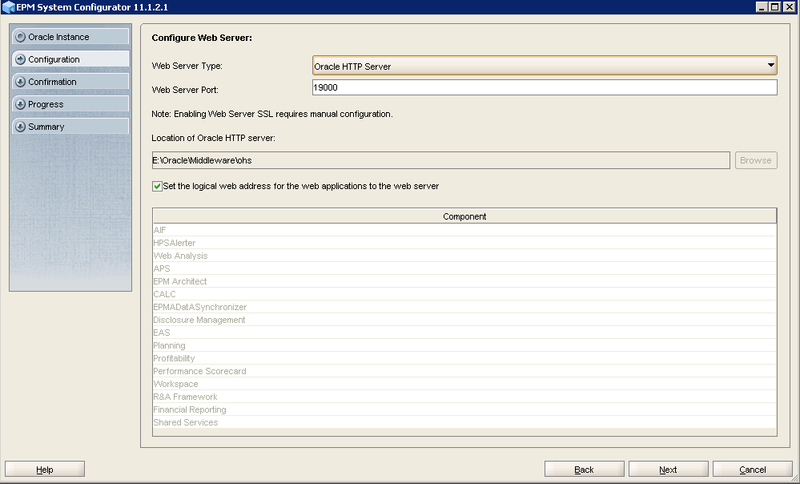 Database user password – this is the password of the account used for configuring the one database in the configurator. Unfortunately I hit a bit of an issue and thought I would explain why it happened as I am sure I won’t be the only one that gets hit with it. The compact deployment ran through and by watching the command window intently I noticed errors appear and in the end was awarded with a pop up message stating startEPMSystem.bat did not exist. 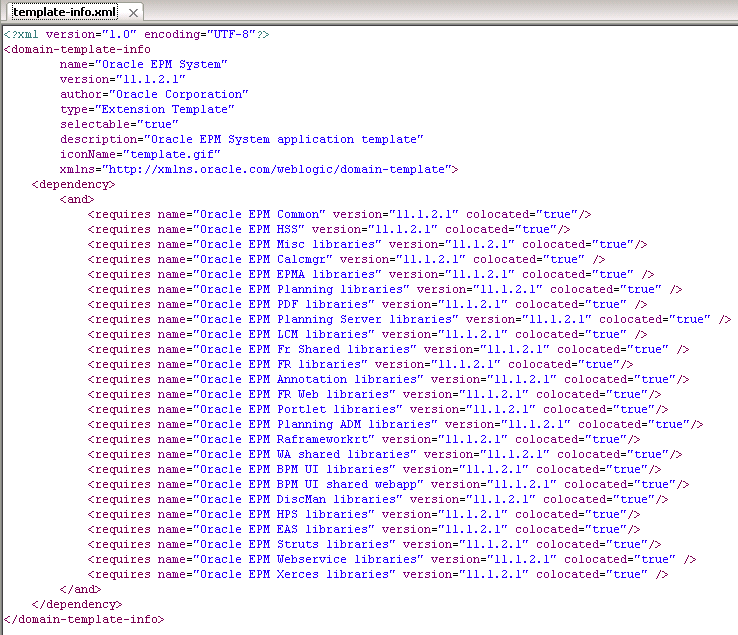 The problem started to manifest when a WebLogic script is executed to create the domain and add the EPM library templates. It seems that there are a number of mandatory products that need to be installed before the compact deployment can be carried out. 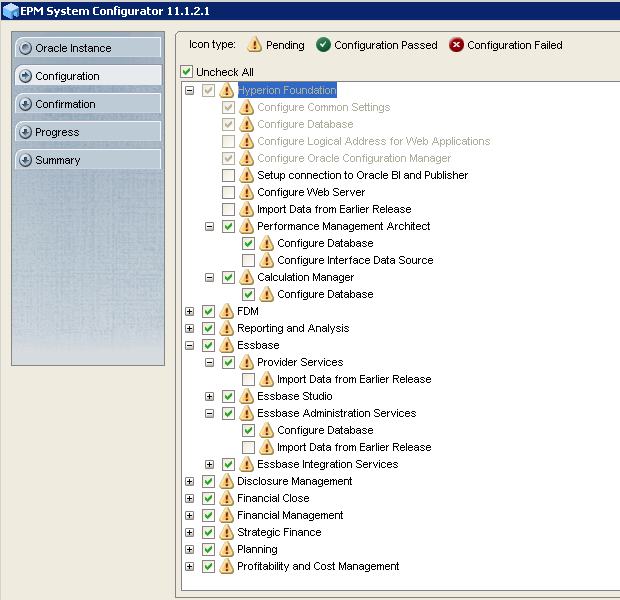 So depending on what products have been installed will determine the exception generated, in my case the only product I had not installed was Performance Scorecard and that is why the error around “Oracle EPM HPS libraries – 11.1.2.1” was being generated. 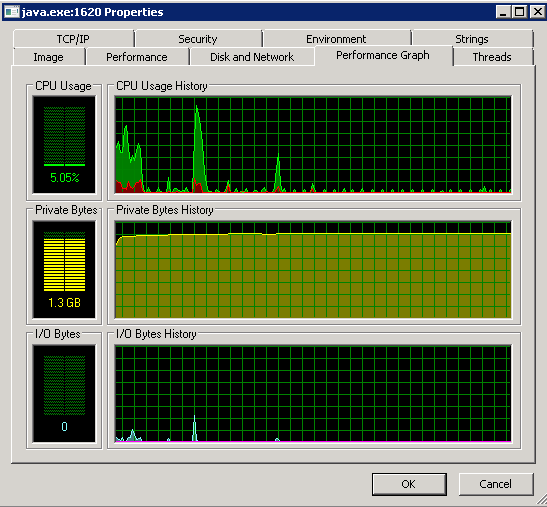 This left me the only option to install Performance scorecard and then configured the non web app elements. 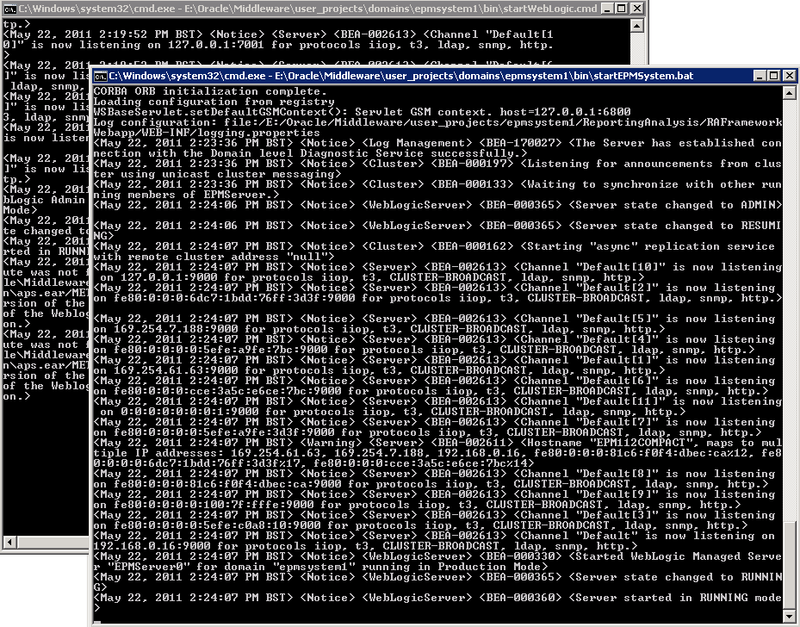 Once complete “runCompactDeploy.bat” was executed again. If you log into the WebLogic admin console for the epmsystem1 domain you will notice a server has been created called “EPMServer0” running on port 9000, this means all the EPM web application will be running against that port. 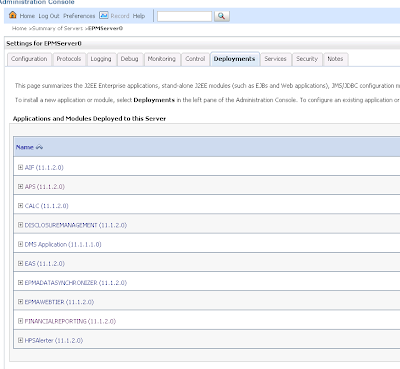 To view all the web applications deployed in the managed server click on “EPMServer0” and go to deployments tab. The admin server can be stopped to save memory as it is not required and the "EPMServer0" managed server can be run indepently. It is possible to test logging into some of the products using port 9000 but for all the products to communicate correctly through workspace the final step was to configure the http web server element. No windows service is created by default to start/stop the managed server, I am sure it is possible to create one and maybe it is something I will have a look at if I ever get the chance. A quick look at the Java process running the WebLogic managed server indicated the minimum memory being consumed was 1.3GB, so if you compared that to starting the entire set of EPM web applications in a standard deployment then there is a considerable difference, starting up just “Foundation” and “R&A Framework” web applications can consume around 1GB. Depending on the available memory on the machine being deployed on the JVM maximum memory can be increased and with it being 64bit then there is less of a constraint on an upper limit like with 32bit. 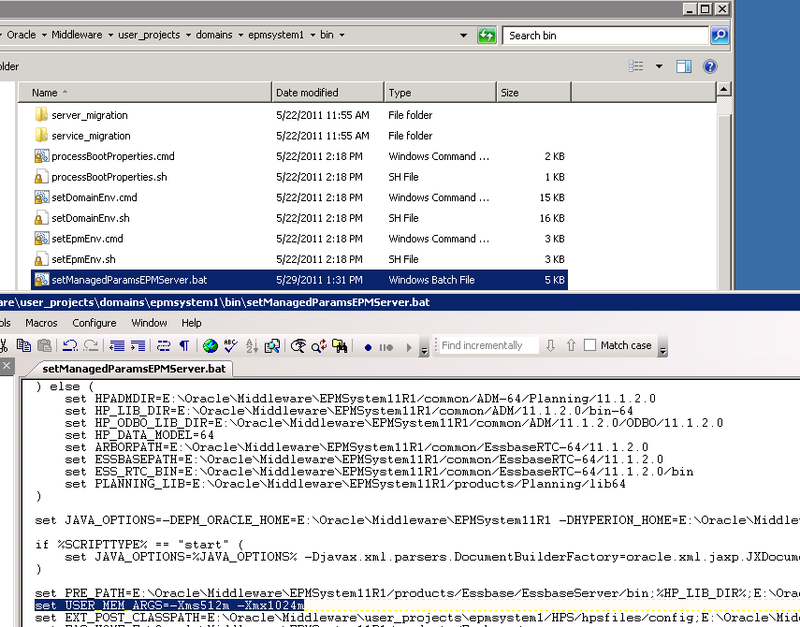 To increase the JVM edit <MIDDLEWARE_HOME>/user_projects/domains/epmsystem1/bin/setManagedParamsEPMServer.bat and update the value for -Xmx then restart the managed server. I have not had a chance to really put the system through its paces but the performance seems reasonable considering what it will be used for, I recommend you try it out and make up your own opinion but at least it opens the door for deployments on machines with a lower memory capacity. The recent release of planning 11.1.2.1 brings new application administration features which are worth a quick mention. These can be accessed from workspace under Administer > Classic Application Administration > Planning Administration. Even though it is being accessed through Classic Administration it also applies to EPMA enabled applications. The Upgrade Wizard is a new addition. Previously if any data source elements had changed you would have to edit each data source individually, now it is possible to mass update this information. So for instance if say the essbase server was rehosted or account information had changed then all the data sources can be updated at once. Select the data sources that require updates, enter the new information, apply then save. 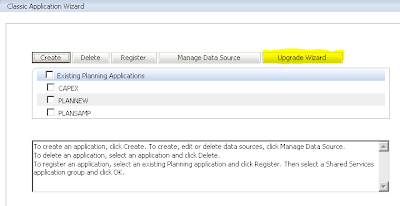 In previous versions if you wanted to upgrade a planning application to the latest release you would have to log into the planning application and select migrate, it is now possible to upgrade multiple applications at once which saves time if you have just upgraded planning. If you have never understood what happens when a planning application is upgraded it is worth having a look at the log as it will give you a good idea of the steps taken. 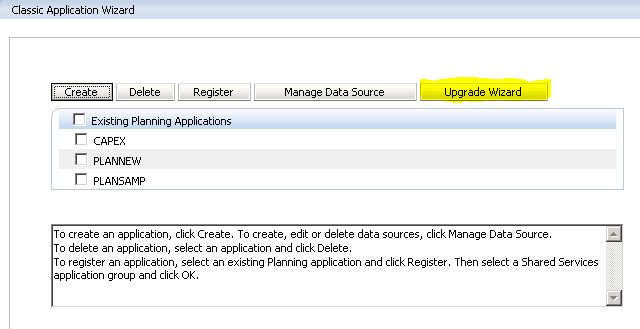 If you are using the Reporting Application functionality essbase server connection information changes then it is possible update this for single or multiple applications. I did notice a security flaw with the new functionality as if you go directly to http://<planning_server>:8300/HyperionPlanning/UpgradeWizard.jsp then anybody can access the Upgrade Wizard pages without the need for authentication, I am sure this will get fixed in subsequent patches but something to be aware of at the moment. One of the new features in planning 11.1.2 was the ability to map and push data to a reporting application, I covered the reporting functionality in an earlier blog which you can read here, one of the drawbacks was if you wanted to push the data to an essbase database it had to be done manually, depending on the size of the data the export/import could take a while and it would be something you would want to schedule out of hours. With the release of 11.1.2.1 a new command line utility called PushData has been created, the utility provides the functionality to automate the pushing of data for any Reporting Applications that have been set up in a planning application. Most of the parameters are self-explanatory, if optional /C is used then the data on the target is cleared first. The log will capture whether the pushing of data was successful or not and any members that are skipped due to not existing in the target. It is also possible to check the status through the Job Console within the planning application. I did notice some strange anomalies in the log as shown above. After successfully running the command line utility it can be batched up and scheduled using your chosen scheduler to run at required intervals.